Image caption Extra years by the sea? Academics at Sweden's Karolinska Institute analysed the lifestyles of 1,810 people over 75. These results should put an extra spring in the step of everyone in later life. The report's authors said: "Our results suggest that encouraging favourable lifestyle behaviours even at advanced ages may enhance life expectancy." Professor of public health at King's College London, Alan Maryon-Davis, said: "These results should put an extra spring in the step of everyone in later life. "They provide good evidence that even in your seventies it's not too late to gain an extra few years to enjoy life by keeping active, living healthily and being involved in family and community." Meanwhile Michelle Mitchell, from the charity Age UK, said there was "no doubt" that being active and having a healthy lifestyle would help people to live longer. "It's never too early and never too late to make those small changes that can make a big difference," she added. 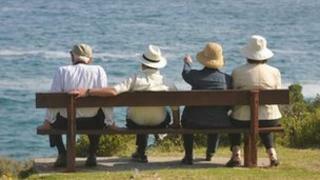 Do those who retire early live longer?